Next: Lawn Lights - Illuminate Your Entire Yard! 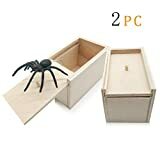 This cool new Scare Box Spider Prank may seem like a little harmless wooden box at first, but when someone curiously slides open the top... out jumps a wiggly rubber spider! 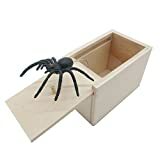 This thing makes a perfect evil gift for anyone scared of spiders, pranking just about anyone, or can just be left out on a table or counter to punish those who like to snoop around through your stuff. Check out this video to see it in action. Cool huh? 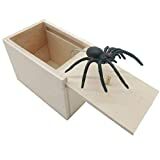 Place the box on a counter or side table and let people discover it on their own.